The drugs were seized by customs officers at Rosslare Eurport. Defor (right) and Ralph (left). CANNABIS WITH AN estimated street value of €90,000 has been seized by Revenue in Wexford. Sniffer dogs alerted officers at Rosslare Eurport to a suspect vehicle which had disembarked from a ferry from Cherbourg. Officers searched the vehicle and discovered the drugs hidden in gas cylinders. A UK national was detained for questioning. It is the second seizure by Revenue’s Customs Services at the port in two days. Cannabis and ecstasy with a combined street value of €63,200 were discovered in the back of a car, also arriving arriving from Cherbourg on Thursday evening. Gardaí arrested two Polish nationals, who were taken to Wexford Garda Station for questioning. 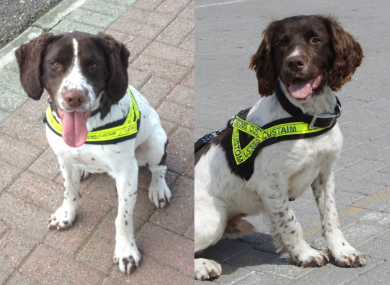 Email “Dog duo Ralph and Defor help seize €90k worth of cannabis ”. Feedback on “Dog duo Ralph and Defor help seize €90k worth of cannabis ”.